Environmentally friendly, all logs are harvested from dead-standing aspen trees. 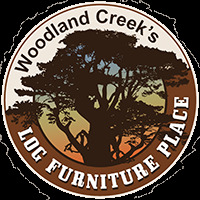 The aspen logs used in this line of rustic furniture are hand-peeled to preserve the natural wood color and character. To ensure strength the assembly technique used is mortise and tenon and then glued and screwed for added strength and longevity. This ensures heirloom quality craftsmanship. Our corner table nestles beautifully between our chairs and futons utilizing that tough to fill corner space. Functional and stylish, this plus size table works well for lamps and reading materials with additional lower shelf storage. Turn this piece into a work of art by upgrading to the extra gnarly style. (see 'More Images' tab above for examples) This style features hand picked logs with extreme character which places it into a class of it's own.